I had made Salted Caramel earlier in the week, and had a huge jar of caramel to use. One thing that I wanted to bake was my Apple Walnut Cake with Fresh Apples, but I wanted to give it a makeover with the Salted Caramel sauce. You see when I think of caramel and apple, I go back to my childhood to the countless number of Affy Tapples that I consumed For those of you not familiar with Affy Tapples, they were caramel apples dipped in crushed peanuts sold in retail locations. I loved the crunchy apples, sweet caramel, and the salted peanuts of the Affy Tapple. As I read on the web now, they were from the Chicago Area. Do any of you remember Affy Tapples? 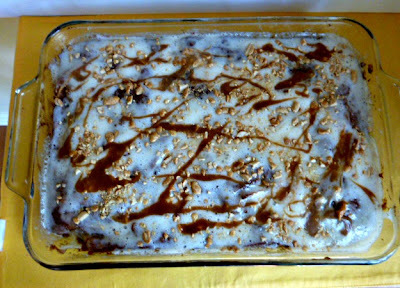 For my makeover of my Apple Walnut cake, I swirled in some Salted Caramel Sauce into the cake batter, and chopped peanuts. then baked the cake. When the cake comes out of the oven, you poke holes in the cake, and pour a hot sour cream topping over the cake. I have been making the Apple Walnut Cake since 1969, so I think that this recipe might have been an original "poke cake." After the topping was poured on top, I drizzled some Salted Caramel sauce over the top of the cake., and more chopped peanuts. Oh, my! Now this cake is even more rich and decadent. I loved my original Apple Walnut Cake, and didn't think that there was anything better, until I tasted the Salted Caramel Apple Cake. It was a bite of pure heaven, and was reminiscent of the beloved Affy Tapples. A Success! 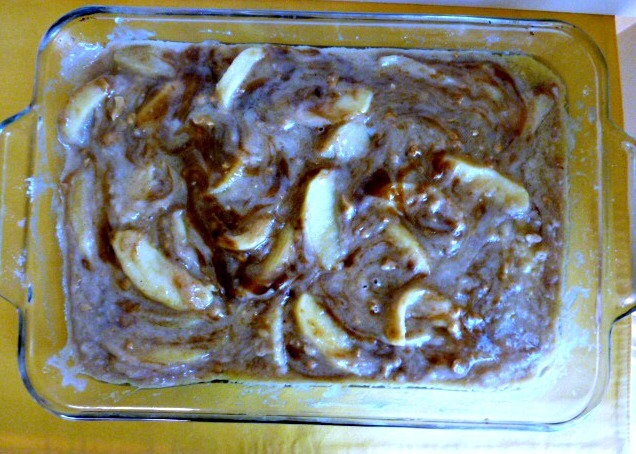 This a good recipe to use some of those apples, that you got at the orchard or fruit stand. If you don't have time to make your own Salted Caramel Sauce, you can always buy a can of apple pie filling, and a jar of caramel ice cream syrup. Shhh! I won't tell. Up until last year, I had never used fresh apples for the filling. Whatever way you make this cake, you are going to love it. Moist cake with tender apples, and salted caramel with crunchy peanuts. Mix eggs, oil, and 1/2 c peanuts in small bowl. Pour over flour mixture in pan and mix well. Swirl in 1-3 c Salted Caramel Sauce. Bake in 350 degrees F oven for 35-40 min, until golden brown. Remove from oven, and immediately poke holes over the whole cake. Pour hot topping over the cake, and top with remainder of 1/4 c peanuts. Combine sugar, sour cream, and baking soda in medium saucepan. Cook over medium heat, just until it starts to boil. Don't let the mixture caramelize. Immediately pour over hot cake, which has had holes poked in it with a fork. Sprinkle with remaining peanuts. Serve warm or room temperature. I like mine warm. You had me at salted caramel. I am loving all things with that stuff in it lately!!! This apple cake sounds dreamy!!!! Salted Caramel makes the apple cake even better. So many delicious used of the salted caramel. I remember Affy Tapples (but then, I'm from the Chicago area too so it makes sense, huh). I'd be MORE than happy to take the rest of that cake off your hands if you really want it out of the house. It looks amazing. Wow great minds think alike sometimes, I did an apple post too! Your making my mouth water with that cake its heavenly! Apples are on the minds of many bloggers today, you, me, Gina! this cake is over the top, delish! I've never had an Affy Tapple, but I think I'd like one. I made an apple cake last night, but I didn't like it, the recipe called for too much cloves, which I should have know better, anyways it was way too spicy. I like this version much better. I've never had sour cream on top of cake, I feel like I've been missing out. I would hide that cake away too before you eat it all. Happy Friday. You would love Affy Tapples and this cake. Try this cake, and you won't be disappointed. I always got rave reviews on the Apple Walnut Cake, so my neighbors thought that this cake wa "out of this world", good, and they aren't biased. What a brilliant idea to add the sauce to the cake batter. I LOVE salted caramel AND fresh apple cake. This has to be a match made in heaven. Thanks so much for linking up at Weekend Potluck. I love the Weeekend Potluck;) Adding the Salted Caramel to the apple cake, put his dessert over the top. This moist cake has sweet apples, with the Salted Caramel, and crunchy peanuts, nothing better! Thank you! This is a wonderful dessert with all the flavors of Fall in one bite! There are so many apple recipes, but this one is heavenly. Oh, this is to die for and I have to make it. It sounds delicious, just like the Affy Tapples! Thanks for the recipe! Do you remember Affy Tapples, too? This apple cake is heavenly, and you won't be disappointed, if you make it. Oh this cake sounds so good! Apples and on top salted caramel and peanuts! I hope you are having a great weekend, Becky! This cake has all the flavors in one bite, apples, caramel, and peanuts! I hope that you have a great weekend as well. 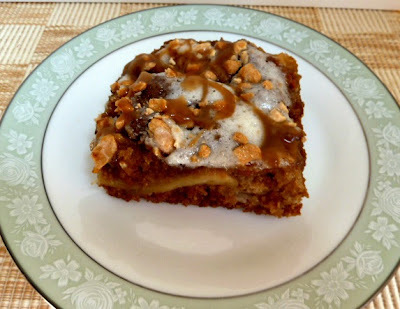 This is a wonderful cake withe fresh apples, caramel, and crunchy peanuts. It's so good. Hi Becky! This looks delicious! Just perfect for fall. I love the caramel (Smile) and you know I love love apples! Thank you for sharing, sweet friend. 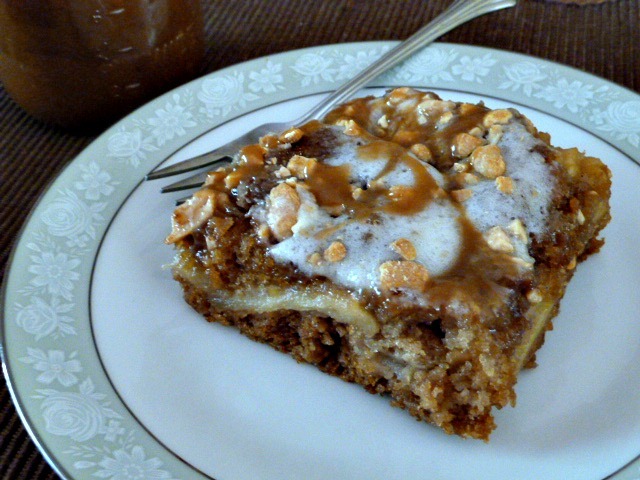 I'd say your salted caramel has turned your yummy apple cake into something insanely delicious! I'd love a huge slice, Becky! Thank you. I tried to re-create the flavors of the Affy Tapples in my cake, and I think that I succeeded. That looks delicious! I love apples, that cake must me super yummy! Great recipe! This cake is wonderful, and I make it many times during the year. The cake is so moist and full of apples and cinnamon. Congratulations on starting your blog, and Best wishes. I'm going over to check it out. Thank you for your kind words abouy my blog. Hi Becky, this look really good. I always love apple and cinnamon. I'm glad that you like the recipe. You'll have to make it. The cake is so good!